Just the wheel by itself pushed against the wood by a spring (friction) and a magnet glued to each position to sense the stopping points (or refective tape, or any type of sensor). One position has two magnets, so the processor knows its “home position” if things get lost. It can spin fast either direction to find the ‘home position’, and then spin slower in either direction to count to the proper locations, always keeping track of which sensor it is on. Or a QR code on each box and a bar code reader scanning them, stopping at the correct box. More expensive though. Just love this project. Even down to filling the drive wheel ‘corrugations’ with glue, to reinforce them! This is such an incredible waste of time and energy. It looks like some “art” piece, with an “artsy” video. These cardboard gears simply do not work and are going to fall apart in less time than it took to painstakingly glue the thing together. Friction wheels have been used for ages and work reliably, from small rubber wheels to standard car wheels. And as noted before position sensing can also be easily done nowaday’s in multiple different ways. You may have noticed Heinlein was an SF writer? I like quite a lot of projects posted on Hackaday, that’s why I come back here. Well I doubt if criticism on this project is of any use. 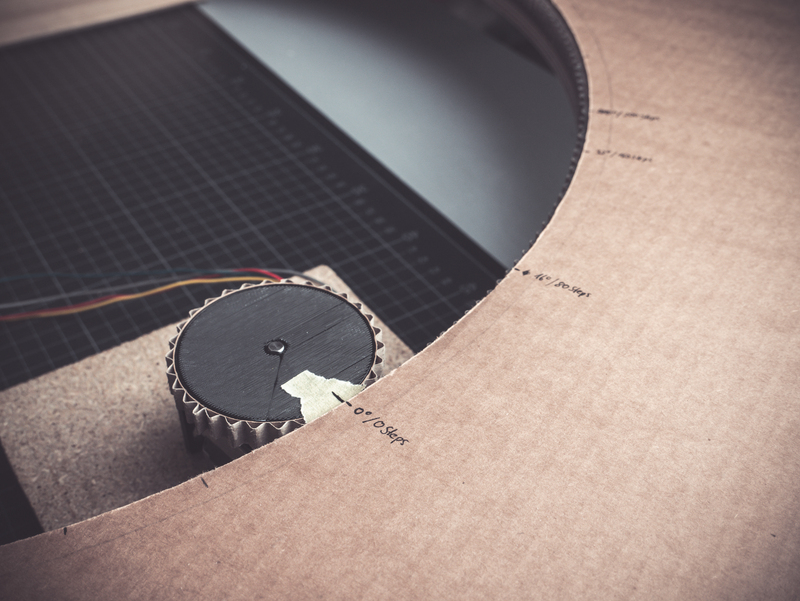 Despite the fact that Paul has some very strong points, the use of cardboard is the whole reason for the project, the goal is to make something move while using cardboard at critical locations, it has to be art and to be honest… the project itself doesn’t even look practical to begin with. So who cares how it is made? But using cardboard is refreshing, it is nice to see people using materials that are highly underrated for their task yet gracefully accomplish the goal, I love it! Thinking out of the box (pun intended). “There are many ways to do it. In other words, he set goals and achieved them. No skin off his back if they don’t match whatever your arbitrary goals are. To be fair, “effective” isn’t usually seen as an arbitrary goal. The scanner is coming up in a later update. I like the way the servo motor is on an inside ring. I think I am going to have to consider using this design for the turret/azimuth controller for the passive synthetic aperture radar mount build. Thinking I can keep more electronics out of adverse weather conditions this way also. Especially if I use a conductive ring maybe with house wiring in a groove and fingers to make a rotor. I’d have used an IR photo eye to detect the slots between the boxes and block one of the slots to act as the home slot. Simpler than this, cheaper, and quicker to implement. If you wanted to be colorful a color sensor would probably work also or a plain photo eye with white black pattern on the inside of the wheel.